Joe Henderson, has been tapped by Lionsgate to write the script for a reboot of the 1986 film. The Henson Co. is set to co-produce the film with the studio. 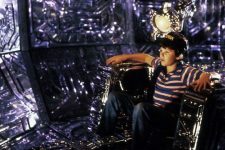 The 1986 original Disney told the story of a 12-year-old boy who is abducted by an alien spacecraft in 1978 and reappears eight years later, still the same age and with no memory of what happened. NASA scientists discover a connection between the boy and a downed spacecraft and try to exploit the boy, who ultimately escapes with the ship and attempts to reunite with his family.